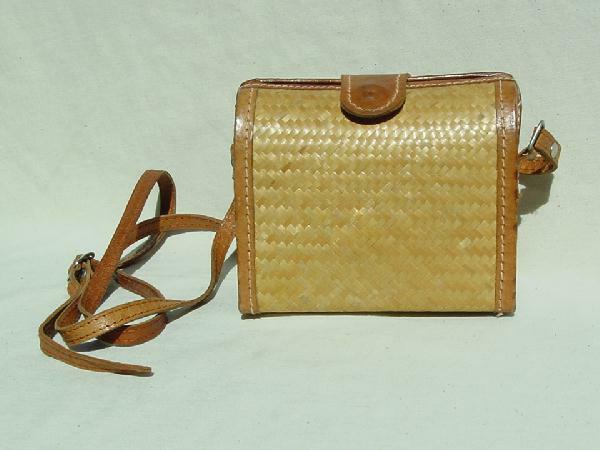 This absolutely charming vintage bamboo matting purse has a long tan leather buckled shoulder strap, flap closure, and edging. It reminds us of something Jean Harlow would have carried in a '30s movie. It has a medium brown fabric lining with a small gathered elastic pocket, and holds quite a bit considering its size. The shoulder strap is 52". It was a present to a model from her (now-ex) husband.